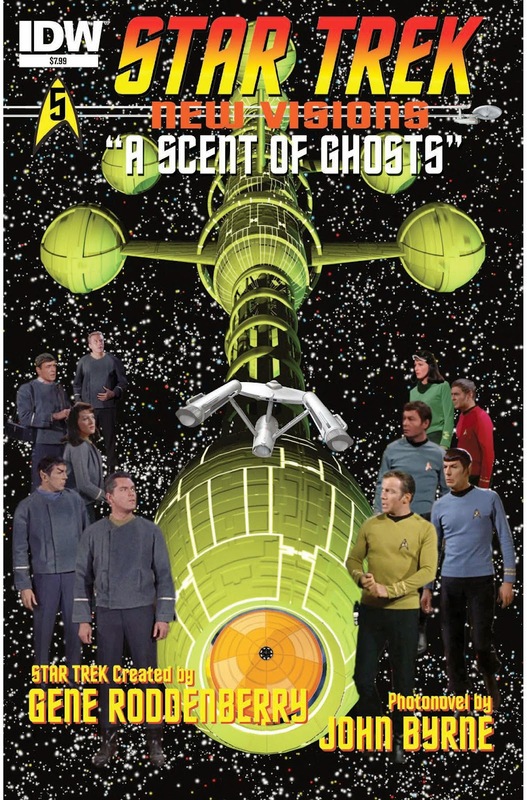 The Fellowship was fortunate enough to obtain a copy of STAR TREK: NEW VISIONS #5 from IDW Publishing. The story and photomontage is by John Byrne, based off the STAR TREK television series created by Gene Roddenberry. A Scent of Ghosts is a decent tale, but can be a little confusing. It’s not one of Byrne’s better TREK stories. On the other hand, the Memorium backup tale is well done yet bittersweet. It was written as a tribute to Arlene Martel, who portrayed Spock’s mate T’pring in the classic episode “Amok Time.” This story coming out just days after the passing of Leonard Nimoy makes the tale harder NOT to get emotional about. The photo-manipulations overall look great. Well done Mr. Byrne. STAR TREK: NEW VISIONS #5 is in stores now, or available for ordering at www.idwpublishing.com.